Finishing off Heart Healthy month's dedication with sweet potato. A standing denial of making bread no longer scares me from my beating weakness. I love bread...just as much as I do chocolate. If I were to choose between pasta and bread...guess who'd win out? Place cheese and homemade butter next to it...I'll be putty in your hands. To my tummy's detriment...I unfortunately can't get enough of bread. Although, I've had no choice but to give up on having it every day...I've pledged to help my heart get what it needs by eating the best products. That surely means more bread making experiments in my cucina...and sweet potato led the way this time. 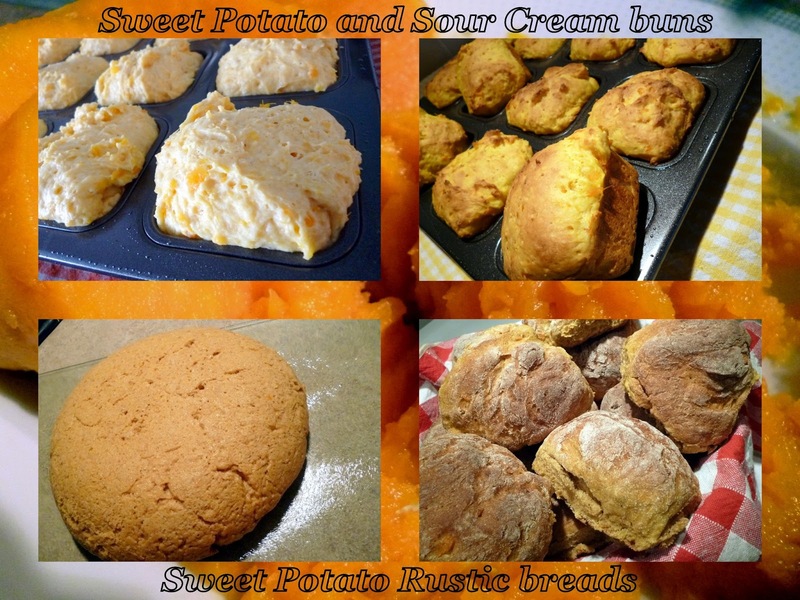 For those that know me either personally or through my adventures with Foodessa...I’m here to finally share some bread creations from my adventurous kitchen. Long, have I confessed to my insecurities towards any type of bread making. Without quite knowing why...I just found it simpler to live in bread making denial. Was it the notion of not measuring up with my favourites from the artisanal bakery...maybe. However, I always had the sense it went much deeper than that. The strange sensation of flour on my fingers may not be something I look forward to either. Yes, some of you are freaked out about earth particles under your finger nails...for me...it's flour. There, I said it.
. An excellent source of Vitamin-A, Potassium, Folate and iron.
. Their high levels of beta-carotene help protect our precious hearts from disease.
. Although, often confused with the starchy Yams...these are different in texture.
. Pick them medium-small, plump and smooth skinned, free of sprouts or decay.
. Avoid the large ones which tend to be dry and starchy.
. It's best to store them in a opened paper bag in a cool, dark place. Do not ever refrigerate them...they will spoil easily and lose their unique flavourful qualities. It’s best to steam or roast them with their skin intact. This will preserve their sweet flavour and moisture, but most importantly their nutrients. I thought it was important to slow roast the sweet potatoes with its skin on. Take advantage to roast a few...they'll come in handy for so many recipes. Slip each sweet potato into a piece of aluminum foil. Bake into a heated 225F/110C/Gas1/4 oven for about 90 minutes. If rushed, crank the heat to 375F/190C/Gas5 and bake for about 40 minutes until it's fork tender. Another technique would be to simply poke the potatoes and place them uncovered in a pan. Depending on size, bake them at 375F190C/Gas5 for about 45min. to 1 hour. Remove from the oven and let the potatoes come to room temperature before easily peeling them. Note: this could be done ahead of time and kept refrigerated for a few days without spoilage.
. 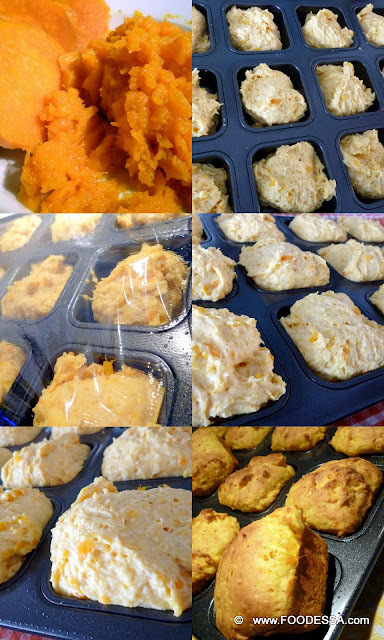 Freezing the mashed sweet potato works just as well.
. Position the oven rack on the second level from the bottom.
. Prepare and generously grease a 12 unit metal pan like for muffins or small squares. Set aside. 1. In a medium bowl, beat the egg and salt. Whisk in the sweet potato purée to combine. Set aside. 2. In a large bowl, combine the first portion of flour (1 cup /150g) along with the sugar and the yeast. Whisk and make a well. Set aside. 3. Meanwhile, in a small pot, combine and warm the sour cream, water and butter on low-medium heat. Give it a stir every so often. When the butter has completely melted it has basically reached the proper temperature. Remove the pot from the heat and immediately add this liquid mix to the flour mix while briskly mixing with a heavy whisk or solid spatula for about 30 seconds. 4. Now, blend in the puréed sweet potato mix. 5. Afterwards, add the remaining flour by continuing to combine the flour until all flour traces have disappeared. Don’t over mix. 6. Lastly, with the aid of a large ice-cream scoop, place a full and leveled scoop of dough into each pan cavity. 7. Cut a long piece of plastic wrap and cover generously with a spread of oil or vegetable spray. With the greased side, place it on top of the dough. Set the pan aside in a warm area and let it rise as it doubles in size for about 1 hour or so...depending on the surrounding temperature. pre-heated oven, for 24 minutes in a dark pan. Adjust a few minutes more for a lighter pan. Remove the breads from the pan as soon as possible and let them cool on a metal rack. Enjoy. 1. In a medium sized measuring cup, pour the warm water (~110F/ 43C). Add the sugar and yeast to the water. Give it a good whisk to dissolve. Lightly cover with plastic wrap and place it into a draft-free area like a turned off oven. Let the yeast properly foam and activate for about 10 minutes. 2. In a large measuring cup, lightly whisk the eggs. Add and whisk in the honey and sweet potato. Set aside. 3. Place the flour, flaxseed and salt into the mixing bowl of a food processor / mixer. Use the dough attachment and adjust to a MEDIUM speed (#2 for most). Start whirling the flour mix before very slowly pouring the yeast liquid through the top spout. 4. Now, gradually pour in the egg, sweet potato mix. 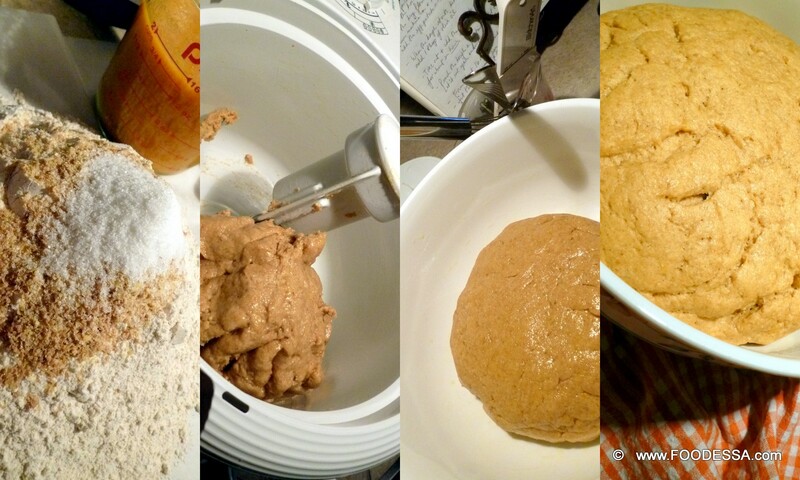 The dough is ready pretty quickly as it pulls back from the sides of the bowl and forms a ball. Let the machine run for another 3 minutes. 5. Turn the dough into a large and generously oiled bowl. Let it rise with a plastic wrap tightly covering the bowl, topped with a tea towel. Place it into a draft-free oven and let it rise to double for 1 hour. 6. Take the dough out to "punch" it down in order to release its gases. Place the covered bowl back into the oven to have it continue rising for another 15 minutes. 7. Lightly oil a very large, rectangular pan. Then, lightly flour a parchment paper to place the risen dough. Roll it into a log and slice it into 16 even pieces. Roll each piece into rustic balls and sparingly place them in the pan with reasonable space in between. Cover the pan with an oiled plastic wrap and then also add a towel over top. This time, give them a chance to rise on the counter. A proper rising will take 1-1/2 hours. ...BAKE...Position rack at the bottom of the oven. Pre-heat the oven to 350F/180C/Gas4. 8. BAKE for 30 minutes in a dark pan or 25 minutes in a lighter one. The buns should have turned golden brown. 9. Remove pan and let the buns cool for about 15 minutes before flipping the whole pan onto a large metal rack. Afterwards, re-flip the buns again. About 15 minutes later, gently pull the bread buns apart. Note: These buns freeze very well. Enjoy. 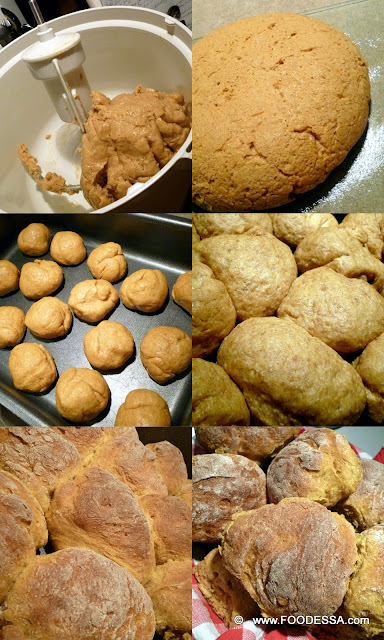 These buns were kind of my entry point to stepping into the vast array of bread making. It seems that I've finally conquered my fear. One day I’ll have to definitely confront a bigger loaf. I'll cross that bridge hopefully soon.